towards something better necessarily, just away from something much more terrifying than the unknown future. It was with this mindset of helper that I worked, and heart-set of love and compassion, and physicality of determination to sweat out the pain of a world that could let this happen in the first place. My objective as a HAPPI ambassador partnering with the Lighthouse International team was to help prepare the camp as the welcoming rest stop for the weary traveler refugee who is momentarily ecstatic for surviving the journey, a much-needed pause before contemplating what’s next and realizing the arduous journey towards purgatory in Europe until asylum (maybe)is granted. 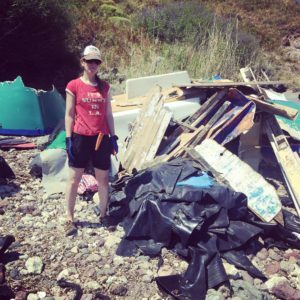 Hauling rafts and boat materials around the shore and cutting them up with imperfect and dulled blades became a meditative ritual, for a Zen-like approach helped us get through the hot, tedious and arduous task. Crystal blues and perfect temperature was a delightful relief swimming among fish and sea urchins and singing Grecian ladies on their daily afternoon dips. This is life for them. The know the current and past history of the sea. They know the secrets and defilements that float carelessly with surrender in this sea. The merciful and merciless gestures she whimsically makes according to her own rhythm. Unrelenting and forgiving, the sea is a source of life-sustaining energy. She can drown you or drown your sorrows for you. She can release you or capture you. She can uplift your soul or swallow you whole. It all depends on the tides. Which depends on the moon. Which depends on nothing very human. Which is an ego relief, isn’t it? We can’t control much and that is a paradoxical relief and horror of our life as human. For today, I clean up. Like a Zen master, I walk and chat in the heat, lifting heavy plastics and rubbers and slice it up with a knife. The muscles of my hands are aching but this is my only job today. Slice, fold, haul. Slice, fold, haul. The definitive task and rhythm is a strange comfort. Nothing else to do. Trying to only feel the sun and sea, my breath my body, my work at hand. Not thinking of the past or future. The zen of healing. Hoping making meaning from this madness to support the apparently fragile truth that this matters. Trying to forget that this task shouldn’t exist. Yes, I know it matters. In small ways that at least enlarge the heart. I gather and hauled the material on a flight to Athens. 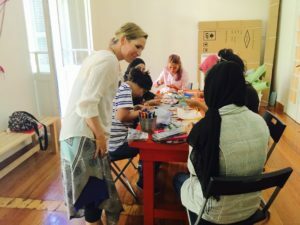 My plan was to guide about 30 migrant women, primarily from Syria and Afghanistan to connect with their bodies and minds in healing ways. 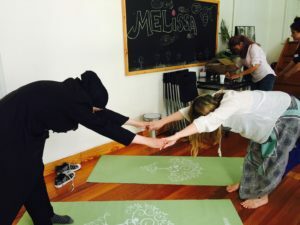 I began each workshop with creating a safe space to engage in breath work and yoga movement which would prime their mind-body-spirits to open up to what needed to be created that day on physical, emotional and spiritual levels. I explained the meaning and method of my offering and how it was compatible with every body, mind, religion. 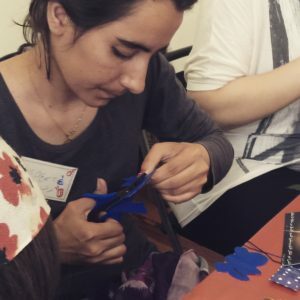 I explained how this practice would open up the creative channels for creativity to flow into their jewelry-making activity. We moved from floor to the tables and engaged in the task of transforming boat materials into jewelry. We explored the symbolism of their journeys and the materials we were working with, me paying attention to anyone being triggered by that process. All were deeply engaged and wanted to work a lot longer than originally scheduled. They were so happy with their creations which manifest in their facial expressions and more flowing and open movements and posturing. They moved more confidently and strongly within minutes and hours. The creative work was a conduit to their spirits flowing and allowing regeneration from intuitive and impulsive places in their psyches and souls that needed to transform destruction into creation. I felt deeply nourished after a full day of workshops an d imagine they did on some levels, too. This is the heart of my “work”: traveling, collaborating, creating, guiding, listening, communing together to build and fortify this vessel of human life. The workshops lasted much longer than we planned and many women asked when I would be back. It’s never an easy answer when funding is an issue. I feel called to support this community in Greece and know that they will continue to be here waiting to make a life of peace and freedom , which will likely take months if not years. I want to say soon, I want to promise, but I can’t with where we are at with our project and funding. 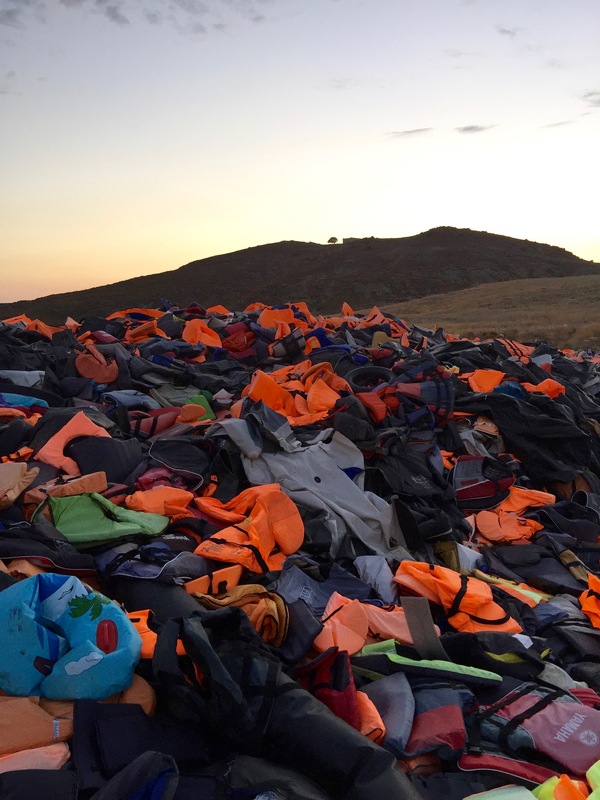 Boarding the flight from Greece to home, now for the second time, feels emotionally painful. Feeling that I did not help enough, give enough, do enough, be enough infiltrates my thinking and feeling. It is not self-deprecating or insecurity, it is the truth that it is not enough. But I also know I can continue to try to expand the offerings with a bigger and more sustainable team and know that it is possible. All the Facebook updates of organizations feeding the refugee friends, supporting them with legal help, and giving medical attention, feels very positive and are filling desperate and large gaps in the humanitarian aid channels which are clogged with bureaucracy, politics and even corruption. Mental health is the neglected area which have reverberating effects on individual, family and community levels if not treated. I believe the culturally sensitive and trauma-informed approach to supportive mental health in the most pervasive ways is to elicit these streams of psychosocial, mental, emotional and spiritual interventions from the refugee community themselves with our support. When the expressive arts and other healing modalities are activated, they have a life force of their own, and the intention is that healing reverberates in the individual, family and community and ripples to sustain and proliferate the healing effects and increase resiliency for the present and future stressors they are and will endure on top of all they have endured already. 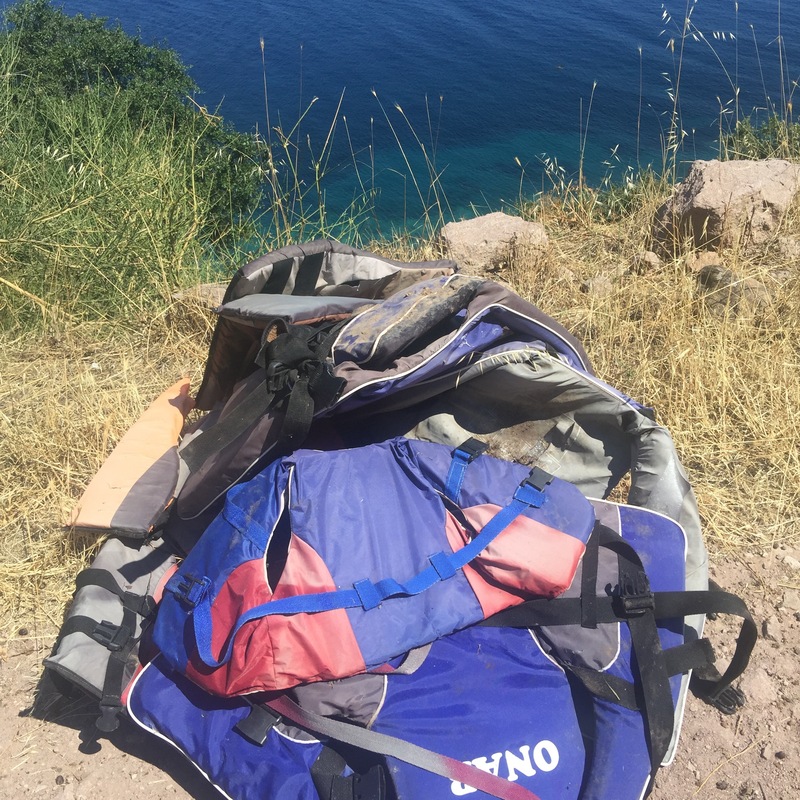 If you are interested in sponsoring or supporting HAPPI’s projects in Greece please donate via paypal @ ali@healingartspeaceprojects.org, contact us to be an on-going partner/sponsor, or visit our etsy shop to purchase the life boat jewelry https://www.etsy.com/shop/lifecyclegoods.